Much like working as a lawyer, one of the nice perks of working at a marketing agency is getting to know what our clients do. After having had the privilege of working with several groups of referral veterinarians, I can say that they do some pretty amazing things. Even better is that these people are amongst the most talented, business savvy, and compassionate professionals I’ve met. That, and they’re a lot of fun. How many law firms have a mechanical bull at the grand opening of their new office? Referral veterinarians are the vets that other vets call when specialty care is required. We’re talking veterinary orthopaedic surgeons, dermatologists, cardiologists, rehabilitation therapists, etc. 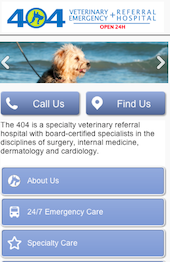 We started with Canada West Veterinary Specialists in Vancouver, found our way to Lake Country Veterinary Specialists in the Okanagan, and have now just launched a new website and mobile site for 404 Veterinary Emergency and Referral Hospital in Newmarket, Ontario. Having just visited 404’s facilities, its not much of a stretch to describe them as the Mayo Clinic of veterinary services. They offer a team of dedicated veterinary specialists, supported by a small army of staff in a brand new, state of the art, facility. After a tour, I was ready to get a dog just so that I could take them to use 404 hydrotherapy facilities. Dr. Joanne Fagnou, our point of contact, a rehabilitation specialist and one of 404’s owners, has worked very closely with our team over the last year to bring this project to life. While many of the pages remain in development, we’re very happy to see this project live to the world. Joanne first approached Skunkworks after seeing Canada West’s website. For 404, she was looking for something very colourful, friendly, and interactive. Looking at Lole and Fitzpatrick Referrals for inspiration, we got to work. The result is a completely customized WordPress website that allows Joanne’s team not only to update content, but to alter the overall look-and-feel of the website on the fly. Whether background patterns that change with the seasons or index pages informed by underlying content, we’ve done our best to put the client in control. Throughout the site, we’ve used coloured tiles that reveal themselves on either click or hover-over (depending on the device being used). These colours can be adjusted according to individual pages or posts. Similarly, each page is associated with a custom header and a featured image to allow for relevant imagery throughout the site. We wanted to provide plenty of opportunities to show happy puppies and clever kittens. After all, Catvertising remains amongst the most successful marketing tools. While we wanted the site to look pretty, we remained pragmatic about the site’s purposes. In particular, 404 relies on referrals from other vets and we’ve provided several different ways that the referrals can be completed, including an online referral web form. The mobile site serves a very different purpose. Analytics suggest that >90% of mobile visitors to vet websites are looking for either a) immediate phone contact or b) directions to 404’s facilities. We’ve focused on these two particular use-cases by minimizing the primary site navigation and cutting most of the imagery. I even used the mapping system to find their new office. Our hope is that this new website showcases just what 404 does on a daily basis. 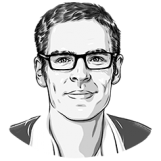 As the content fills-out, it will be increasingly clear that they can do some pretty amazing things. If the furry members of your family need special attention, you’ll know where to find help. 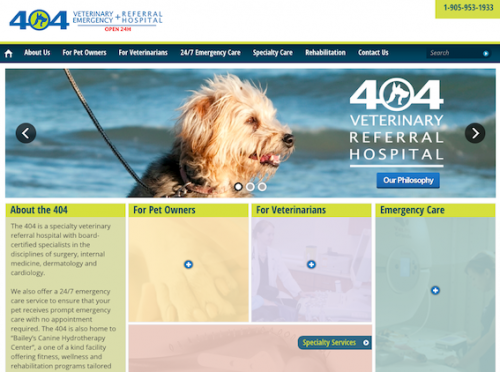 The new site is located at 404vet.com. The mobile site can be previewed at m.404vet.com.